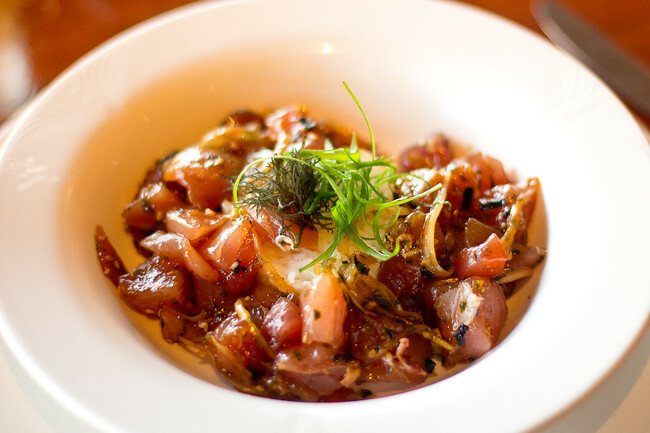 While Maui is part of the United States, Hawaiian food is a complex and delicious blend of many cultures including the Philippines, Portugal, China, Korea and Polynesia. And while I have been busy shooting guns, snuba diving, playing the ukulele and riding mules, the most exciting part of Maui is undeniable. I am here to eat. The most well-known and controversial food in Hawaiian cuisine, poi is a glutinous paste made from the taro plant, which is kind of like a yam. 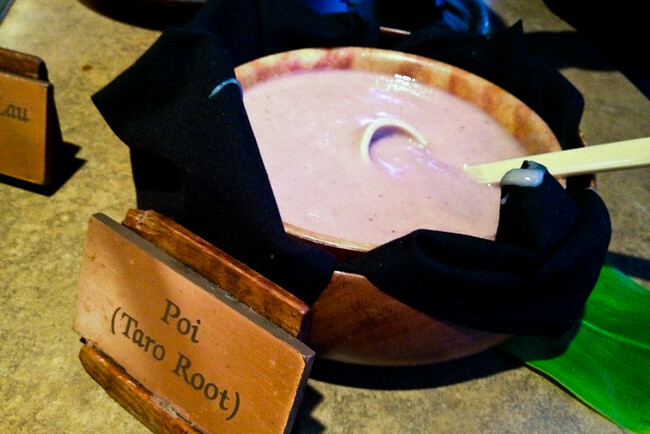 While I love taro, poi is slightly fermented and I cannot get over the sticky texture. If you tell a local you have not tried poi yet they all watch in anticipation because it’s not well liked. 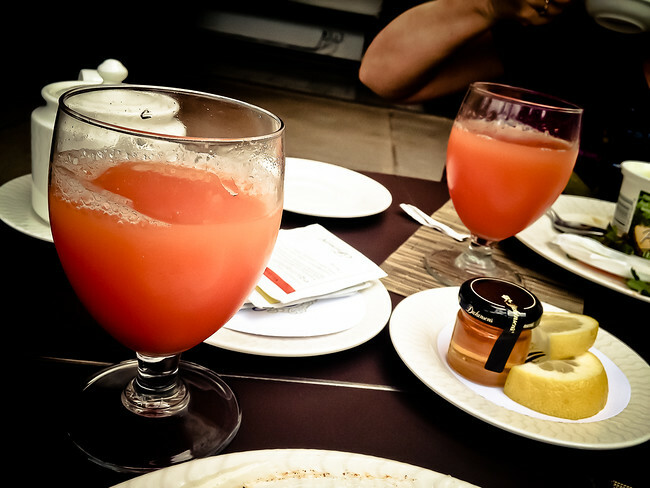 If you want to sound like a local at breakfast order some POG – pineapple, orange, guava juice. It’s not always written on the menu but it is definitely available. Now this is a dish that I would truly call magic. Slow roasted pork in an underground oven, if you go to a good luau there is a moment where they take the pig out, otherwise they may cheat it and take it from an oven. The tender meat is then shredded and is so moist and full of flavour. If you like sushi you will love poke, which is essentially a raw fish salad. It’s simple but requires fresh fish, find out how to make poke at home here. Chuck was born and raised on Maui and after a few years traveling the world he returned and bought up land to start organic farming. 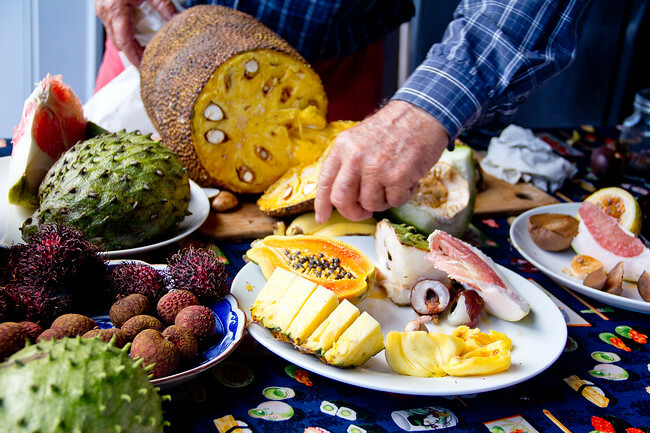 He has an amazing fruit tasting tour where you will eat fruit you have never seen. If you’re heading to Hana you must stay and speak with him. A very traditional dish and found at most luaus, pork is wrapped in taro leaves and cooked until tender. I could take it or leave it and actually forgot to take a photo, but perhaps it’s because the taro leaves looked like spinach so I ate them – don’t make that mistake. Salmon mixed with tomatoes, Maui onions and chili pepper. I did not love it and I’m not sure why. 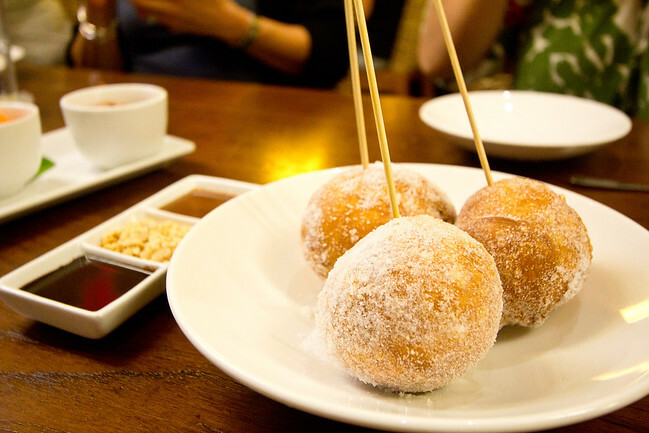 Portuguese donuts deep-fried and coated with sugar. I’m not a dessert fan but these Timbits are delicious. A dish unique to Hawaii but inspired by Japanese, Chinese and Filipino dishes. This noodle dish was developed in the plantation era. 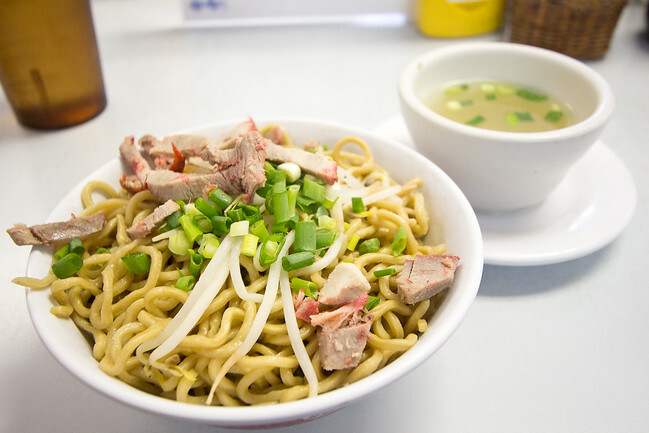 The photo above is dry saimin, you can add the broth as you wish, from Sam Sato’s. 11. Any kind of fish you can get your hands on. While the pork on Maui is delicious, I was overwhelmed by the quality of the seafood and ordered it every chance I could get. There was only one occasion where it was overcooked, and even the little diner in Lana’i understood that food didn’t have to be fancy if it was fresh. A cross-breed between two other types of potatoes, in this case it happening by accident or serendipity depending on how you see it. The result is a delicious potato that makes incredible mashed potatoes like I had at Ko, or a vegetable frittata from Napili Kai. If you see this on the menu order it! And while it seems like all I did was eat there was so much I missed out on: spam musubi, shaved ice and I couldn’t bring myself to try loco moco, a heavy blend of rice, fried egg, burger patty and gravy! Maui is a really special place, it’s far more than beaches and golf courses. There is an incredible culture that is so strong and the first place to look is the food. Disclosure: I was a guest of the Maui Visitors Bureau, they did not request that I write a positive review or pretend that I like poi because honestly while I think you should try it I’ll be surprised if you like it. Did you try Pigs Feet Soup? I have a terrible story that revolves around trying Pigs Feet Soup while I was in Hawaii (well before my Pescetarian days). Copious Amounts of Tequila + Pigs Feet Soup. I missed pigs feet soup?? I love pickled pigs feet I am so disappointed. Oh my, POG is what I miss most about Hawaii. And being the sweet potato lover that I am–I cook with those bad boys at least a couple times a week–how have I not sampled #12?! I may miss the Moloka’i sweet potatoes the most knowing I can’t get them anywhere else. It all looks delicious!! I have taken on a chef job here in France at a Bed and Breakfast. Needless to say it has allowed me to pack on a few lbs! You have? You must write about it I’d love to hear your stories. 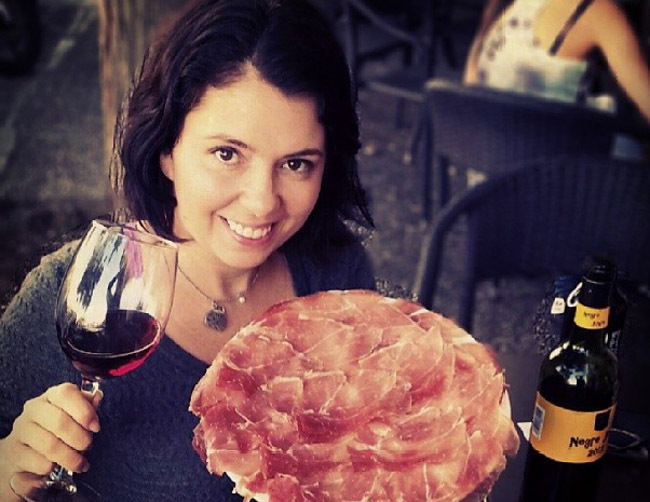 There were really few things I didn’t love on Maui and you can’t like all food! The Malasadas look delicious! But then again, I thought the Poi looked like it would be good, too. It’s a shame I’m not more of a seafood fan. Most of it makes me quite ill, which sadly limits me from experiencing the cuisine and character of many cultures. Oh I’m so sorry to hear that, there is a lot of great pork on the island too. Sign me up for POG and that sweet potato – oh and of course fresh seafood. Sounds pretty wonderful to me. Growing up on the East Coast I am very particular about fish but when it’s this fresh it’s hard to screw up. Ahhhh I get so excited on the plane over to Maui when they serve POG!!! My favorite! I didn’t even think to ask for it on the plane! Wuoh..I’m currently drooling over my keyboard at my desk..and it’s only 11AM. Lunch time cannot come any sooner! Awesome pictures! It helps when the food looks this good. Wow! what are these delicious food for me. I’m very excited to your attractive presentation. Also thanks for these excellent photos. Everything looks delish! I would try everything you wrote about here. I eat about almost anything! Lomi lomi salmon looks refreshing. I love salmon but there was something on it I didn’t care for, but I’ll try anything once and most things twice. After getting to number four, I hoped everything would begin with or feature the letter P in its name…alas, it was not meant to be. Seriously though, POG for breakfast sounds amazing and that pork…well, anything with pork is good in my book. 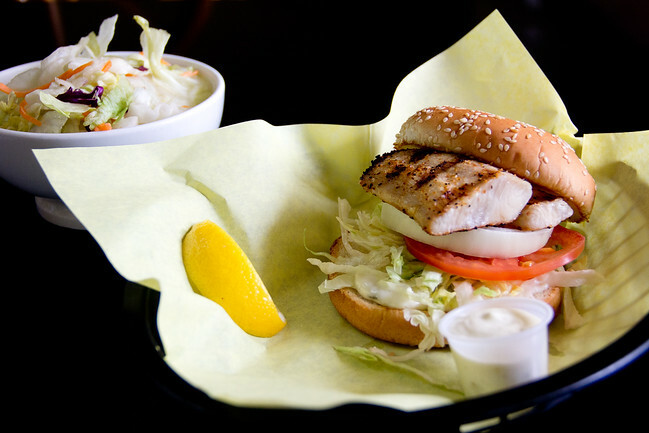 That fish burger (that’s what it is, right?) looks FANTASTIC. I could sure use some of that right now. The fish burger was just some diner joint, it didn’t look special at all but the fish was amazing. Of course, it would be better if we could enjoy it in magical Maui! Then let’s all go back to Maui! If I had relatives there I would go all the time, I was actually surprised at how cheap flights are. Really? I had the opposite effect. The flights were very expensive. I guess it depends on where you live. Location, location, location. Well you can make poke at home! Alas there is no substitute for the Moloka’i sweet potato. So many delicious things on Maui and this post was just the start. I know! I kept asking around for the best place because I have NEVER eaten it and then I just ran out of time. That juice sounds like such a refreshing combo! And, as for the poi, I LOVE taro. But, not sure if this could work for me. Will have to try it! You have to try it, no one says you have to like it! It’s not very typical hawaiian, but I had the most perfect wonderful bagel with egg and cheese in Maui. I don’t remember the name of the restaurant- it was a little cafe near the Banana Boat Hostel. The chef personally brought the creation out to me and kept checking on me to make sure I loved it. It was his work of art or something! I never knew one could take that good. In any case, I strongly believe that we should explore the food when we travel and not worry at all about diets, gaining weight, etc. Sounds like you took full advantage of all the great food! I stayed at the Banana Boat too, but just for two nights, but it’s such a cute end of town. I had my Poi experience on the islands. The first time I hated it. 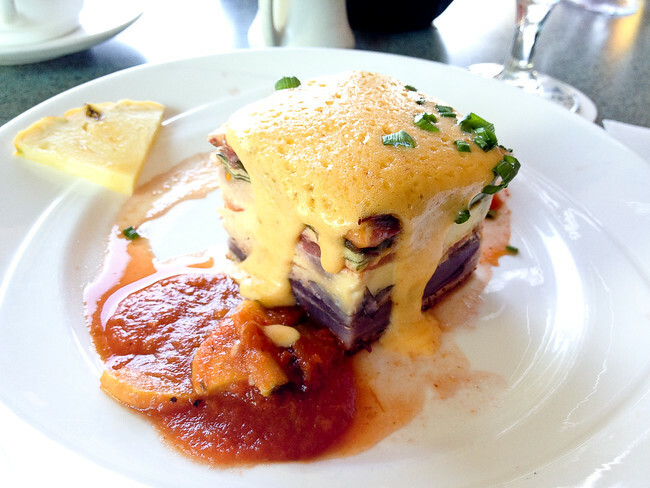 Then I had it at Roy’s on Oahu and whatever the chef did to it, was amazing. I love Kahlua Pork, it is my favorite. Hmm what do you think made it different? Was it still glutinous? 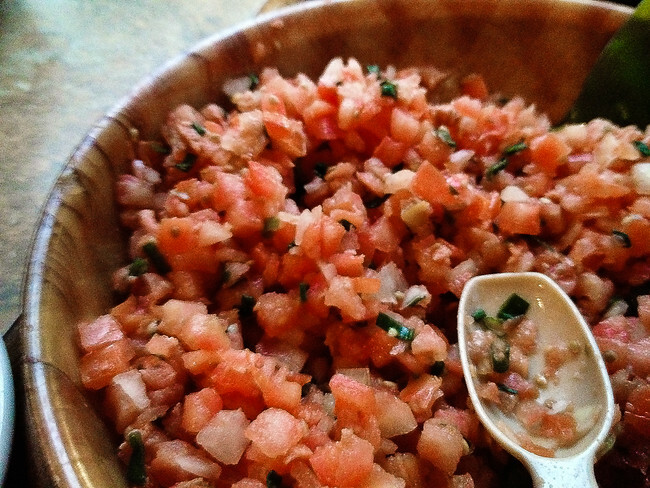 I’m so hungry right now after reading this…food was my favourite part of Maui too! Food is my favourite part of any place. Looks like my kind of food. Would love to try that Moloka’i Sweet Potato. I was impressed by how good the food was last time we were in Hawaii. That Kahlua pork sounds really good, I wish we’d had that too! You didn’t have it? The next time you are in Hawaii it is a MUST. One delicious dish after another. I love this kind of food. Oh, lordy, I’m drooling. Seriously love this post. You’re in Mexico, go out and eat a churro! Do you make it? Where do you get it? Hawaii is one of my favorite destinations – I especially love all the tropical fruit, poke and the saimin noodles. My favourites as well – and of course the pork. Jeremy you’re indifference to food is hilarious. We must eat together some time, I will convert you! Mmm, I love sweet potatoes, so I can’t wait to try the kind in Hawaii. And is that mangosteen I see in one of the photos? Why yes it is, you have a keen eye! The Kahlua pork looks amazing…thanks for making me salivate! You can always count on me for that. I tried about half of these foods when I was in Hawaii. I really loved the ahi and the potatoes. So delicious, nothing better than the ahi. I can’t wait to try all of this when I go to Hawaii! It’s great to get tips of the best things to eat before going. I like how the food really does seem a blend of different cultures too. Thanks!